From left to right: Will Argo from the Bon Hommes, Adam Dukes and Stephen Adams from Weaver’s Weekend, Erin and Bill Weaver, Jimmy Thwaite from Vine-Ingle Little League, and Chandler Penn from Bon Hommes. 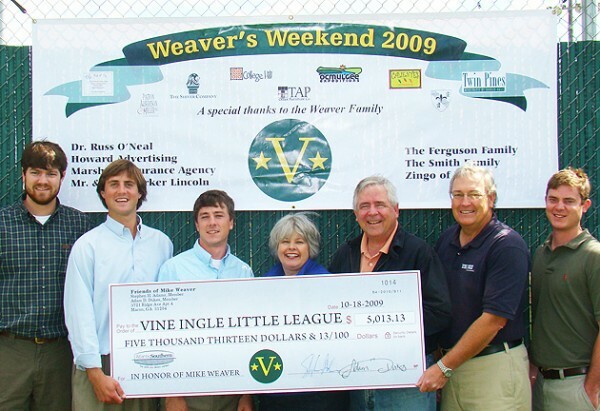 The net proceeds from two fund-raising events — Weaver’s Weekend and the Bon Hommes organization golf tournament — were donated to Vine-Ingle Little League in a ceremony at the Major League field on Sunday, Oct. 18. The fund-raising golf tournament, organized by Will Argo, Chandler Penn and other members of the Bon Hommes organization, was held in May at Idle Hour Country Club. 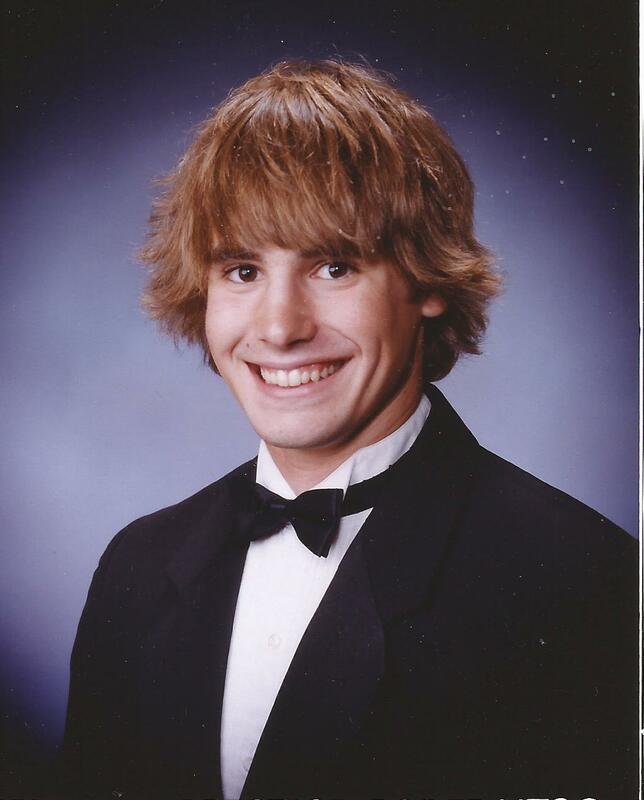 The group donated the proceeds, about $1,500, to the memory of Mike Weaver. The second annual Weaver’s Weekend event was held in August at the Armory Ballroom in downtown Macon. Adam Dukes, Stephen Adams and Rachel Phillips were the chief organizers of this event. 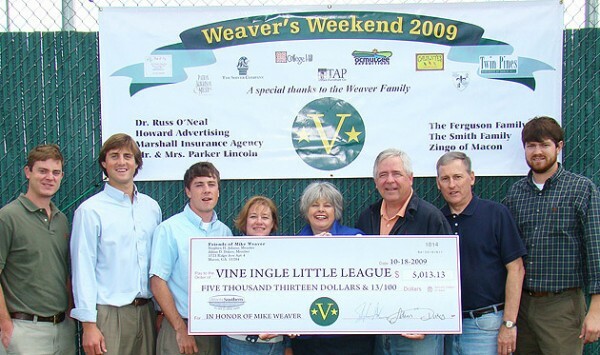 The group contributed proceeds of about $3,500 to Vine-Ingle Little League. The final amount given also includes an additional $13.13, as Mike’s number when he played at Vine-Ingle was the number 13. Thanks go not only to the organizers of these events and those who attended, but also to the companies and individuals who became sponsors, or who contributed money directly to the league in Mike’s memory. Jimmy Thwaite, president of Vine-Ingle, said a group from the league’s board of directors will put together a list of projects that the money could be used for at the Vine-Ingle complex. He said members of the fund-raising organizations would be consulted before the money is committed to any particular project(s). Bill Adams has been instrumental in the process of selecting the winners of the Mike Weaver Award at Vine-Ingle. This photo shows Bill and his wife Cheryl, who has also helped with Weaver’s Weekend. From left in this photo: Chandler Penn, Adam Dukes, Stephen Adams, Cheryl Adams, Erin Weaver, Bill Weaver, Bill Adams and Will Argo. ← 2009 Weaver’s Weekend: Here are the details! Love to see this update. So proud of you guys for continuing to honor Mike’s memory in such a perfect way. What a wonderful tribute to an awesome young man who we all loved. Loving Mike was easy!